Overwhelmed with excitement and causing a dramatic scene, my brothers and I fought over who got to stand nearest the shopping cart as soon as my family walked through Target’s sliding doors. My siblings and I roamed the electronics aisles, stopping at each display case to play the demo consoles until we finally reached the Xbox games. There, we found ourselves basking in the vastness of dozens of video games — the glass display case was the only barrier between me and my next animated adventure. My brothers and I saved and budgeted, pooling together just enough money for the newest Harry Potter video game. After all, we had experienced Harry Potter as a trio: reading the books, watching the movies, and playing the games together. As we journeyed through J.K. Rowling's Wizarding World over multiple media platforms, it was widely agreed that our favorite was the video game. Perhaps we loved the video game because it was interactive and we experienced our favorite parts of the story firsthand. Or, perhaps it was because the game challenged our knowledge of the story, requiring us to know specific information to complete a mission. Either way, the video game platform enhances the player’s experience with a story. It makes the world and the characters personal, achieving something that cannot be accomplished in movies or books. “Playing stories” is the best way to concisely phrase the Harry Potter video game experience. My favorite video game was the interactive adaption of the second Harry Potter book, Harry Potter and the Chamber of Secrets, where the player investigates the mysterious heir of Slytherin and, ultimately, fights in an epic battle with Lord Voldemort and a giant serpent called a Basilisk. 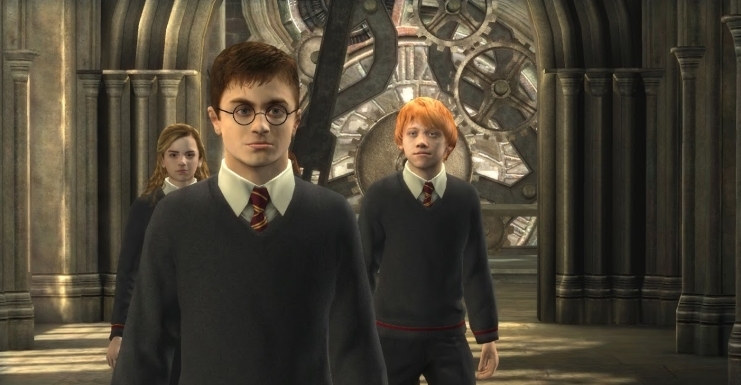 By enabling the player to be Harry and directly engage in the storyline, this video game creates a personal Harry Potter experience that the books and movies cannot offer. The Harry Potter books give the story background and depth, and the movies bring the story to life, but the video games generate the experience of living in the story. The Harry Potter video game experience not only allows players to venture into the Wizarding World, but it also gives them a chance to explore things that are less emphasized in the books and movies. A prime example is the inclusion of recreational games like “Gobstones” and “Exploding Snap” in the video games’ storyline. Though these games are referenced in other Harry Potter platforms, there is no complete explanation on how to play. The video game, however, does offer this explanation and invites the player participate. Collaborating with J.K. Rowling, the video game designers offer insight and closure to finally resolve the unanswered questions about these mysterious wizard pastimes. Furthermore, there are other additions to the Harry Potter video games that add to the well-known storyline. For example, the Harry Potter video games introduce the Gytrash, a supernatural creature exclusive to the interactive version of the Wizarding World. Further, the video games elaborate on the collecting of Chocolate Frog cards—a popular hobby in Harry Potter and the Sorcerer’s Stone. While this hobby wasn’t prominent beyond the first Harry Potter book, the collection continues in the video games. Each Chocolate Frog card contains information on witches and wizards who are famous to those in the Wizarding World, but often unknown to fans of the series. The video game’s inclusion of the Chocolate Frog cards, and the distinguished wizards on them, enables the player to gain a deeper understanding of the characters and their significance in the realm of Harry Potter. Therefore, in addition to providing players with the experience of living through a beloved story, video games give players the opportunity to gain a more complete understanding of a story's world. Similar to the previous examples of how players may learn more about the Harry Potter storyline through an interactive experience, the Quidditch World Cup and Book of Spells video games divulge details that aren’t acknowledged in the books and movies. Quidditch World Cup allows players to compete on national teams in tournament play, which offers a look into the sports and legendary athletes of the Wizarding World. The game has international Quidditch gameplay, including teams from the United States, Japan, Australia, England, and Bulgaria, plus biographical profiles and background information about the athletes and their respective wizarding communities. This video game supplies the player with firsthand experience playing Quidditch, while also providing information on the sport to heighten the player’s knowledge. Moreover, while Quidditch World Cup expands the horizons of the Wizarding World, the Book of Spells game explores the existence of different wizarding communities. It dives deeper into the technicality of spells and curses, equipping the player with lessons in magic and acting as a textbook to coach young wizards. In this way, the Book of Spells and Quidditch World Cup video games enhance the player’s experience by allowing him to participate in situations excluded from the books and movies. Essentially, video games alter a player’s perception of a well-known story. The video games provide knowledge and experiences incapable of being conveyed through other outlets, giving the players the opportunity to relive their favorite moments in a personal way. Collectively, video games provide players with a new platform to interact with storylines from renowned movies and books, offering a refreshing way to play the story.